With June fast approaching and another school year coming to a close, students everywhere are looking forward to the summer break. This also brings another year of the USFIRST Robotics championships to a close. For those of you who are not familiar with USFIRST.org, let me introduce you to one of the smartest after-school programs ever conceived. FIRST (“For Inspiration and Recognition of Science and Technology”), is an organization that encourages Engineering to elementary, middle school and high school students through an exciting yearly robotics challenge. The shortest and best description of the program was given by one of its founders, Dean Kamen, who brought us the Segway, and coined the phrase, “The sport for the mind”. Three short years ago I was contacted by a local high school student and was asked if I would like to mentor their Robotics club to help them design and build robots. It was at that time I was introduced to USFIRST. After judging numerous science fairs and attending many career days, I was left less then stimulated! I thought this would align perfectly and said “sure”. I had no idea what I was getting myself into. Much to my surprise, when I was left alone for many hours with dozens of under-nourished and over-caffeinated high school students… well, it turned out much better than anticipated. After three seasons and seeing many of our members going on to attend universities as prospective engineers, I couldn’t get enough and neither could they. Check out USFIRST, but be careful, it’s contagious! ROBOTS! Check out how they have done in past years. This year’s regional US FIRST high school level regional competition was held at Hofstra University. 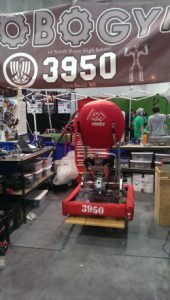 The three day competition hosted 50 independent teams. This year team Brazil enhanced us with their presence and made a very impressive entry that ultimately made it to the finals! In our first year, 2012, we were fortunate enough to receive the “Rookie Team Award” at our regional competition, which granted us the opportunity to compete in the National Competition in the Saint Louis Edward James Dome. Travel to the national Competition required a 24 hour bus ride with 40 excited teenagers. This was an experience of a life time and I truly enjoyed every moment of it!. I won’t try to quote statistics about this program, but they are staggering. Take a look. Well, enough USFIRST promotion. I just wanted to share a jewel. So what’s next for Robotics? I expect that Dean Kamen and Woody Flowers had the foresight in 1989 when USFIRST was founded that Robotics would become a major part of our lives. We’ve all heard about the Amazon drones and Google’s purchase of several robotics companies like Boston Dynamics and just recently the British company, DeepMind, for $500 million. Five hundred million is a drop in a bucket for Google, but buying Boston Dynamics and now the Artificial General Intelligence (AGI) company, DeepMind, hmmmm, what are they up to? We know Google is behind an autonomous car, we also have autonomous vehicles exploring our oceans and soon autonomous cargo ships will be traversing our oceans…Sabastian Anthony of Extremetech.com and others would like to suggest “Skynet”? As anyone can see, with all these new innovations, it’s a wonderful time to be an Engineer. Share your thoughts on the role of robotics in our daily life in our comments section. We’d love to respond and engage with you on thee very exciting developments.